I have found having a dog to be a mixed blessing, when it comes to nature observation. On the one hand, if it weren’t for the dog, I can be fairly sure that I wouldn’t be outside as often, or at least not hiking away from the house. It’s not that I’m lazy or don’t want to go out, but simply that I tend to get caught up in things, and before I know it the afternoon has passed and it’s dinnertime and then it’s dark, and then it’s another day. 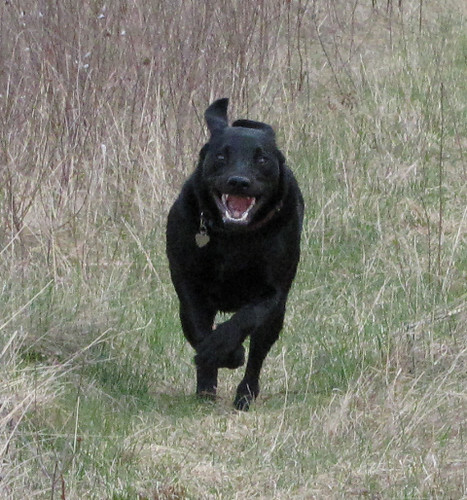 At least, with the concern of ensuring that Raven gets at least a little exercise each day, I pay more attention to the clock and making sure I get out. Dan takes her some days, but not always. Perhaps it also makes it feel less like I’m skipping chores to go play in the sun: walking the dog is a necessary to-do item. I had one of those moments yesterday. I’d taken her for her usual outing. 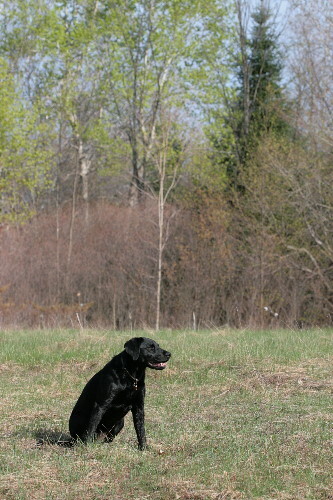 Dan had already exercised her a bit earlier, throwing the ball with her out on the driveway (the only way we’ve found to effectively and completely drain her energy), but it’s not much for mental stimulation so I was just going to take her to the back of the property and back, a change of scenery. As I approached the rear forest, I thought perhaps I’d carry on and do a loop through the 100-acre woods; walking purposefully I could do the loop in about 45 minutes, which was about all I really wanted to spend on break from working, and she likes the forest better than the fields (so do I). But then, when I reached the railbed trail, I changed my mind again. Instead of turning right towards the woods, I turned left. I had no destination in mind, simply to follow it a ways. It goes much farther than I would be capable of going in a single outing. I paused at this little creek that flows under a small bridge in the trail. It was lower than I had expected, the result of the reduced spring runoff and small amount of rain we’ve had so far this spring. Probably in most years it would be flood over the banks a little ways, into the long brown grass on either side. Below the bridge was a deeper spot, a little pool, and I watched for a bit a few fish, chub and minnows and the like, as they gently swam against the current, holding their position relative to the creek bottom. I stood there a while, contemplatively, enjoying the sunshine; Raven busied herself with sniffing things along the trail edges. We don’t, for the most part, put her on a leash in the winter since there’s not much in the way of wildlife for her to disturb, but it’s reaching the time where we’ll have to dig it out again. So she was wandering back and forth, smelling all the interesting smells. I spotted this guy as a shape coming down the river at first. 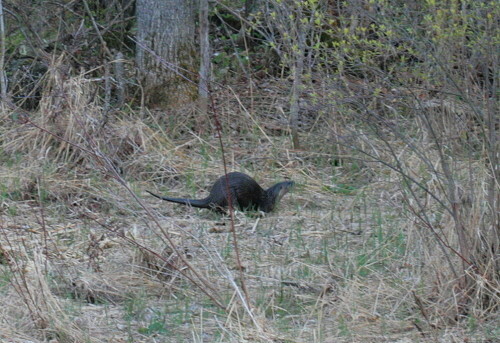 I thought it was perhaps a beaver or a muskrat, but as it drew closer I realized it was neither. Instead, the shape resolved itself into a River Otter. About the moment where I realized with a start that it was an otter, only my second-ever sighting of the species, Raven also noticed it. This was also Raven’s second-ever sighting of an otter; I’m not sure if she recalled the entertaining first encounter, or if it was simply an interesting creature that vaguely resembled other four-legged creatures she knew, but either way she was keen to go down and say hello. I’m quite sure she had only friendly overtures on her mind, as her response to seeing the animal wasn’t the same as how she responds to seeing a chipmunk or squirrel or even rabbit. But I was likewise sure the otter wouldn’t see it that way. I didn’t want to disturb the otter, but Raven wasn’t on a leash. I called to her to come; it gave her pause, but she wasn’t completely dissuaded, and she stood hesitantly at the edge of the slope leading down to the water, one food in the air, tail wagging slightly. I had to call her three times, each time successively louder and firmer, before she finally, reluctantly, turned away from the curious creature and came to sit by me. Unfortunately, she wasn’t the only one to have finally heard me. 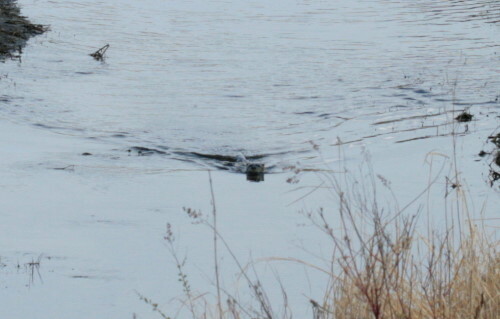 The otter turned and made for the bank, crawling out of the water and through last year’s dried reeds. He (or she) scampered across the floodplain to the woods a short distance away, moving in long, lanky bounds. It was a little strange to see a single, solitary otter, as I tend to think of them as moving at least in pairs, if not family groups. 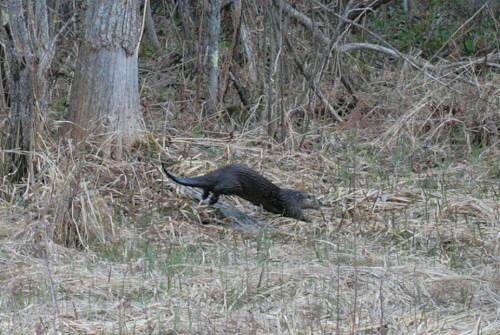 It was also strange to see an otter bounding into the forest, which seemed about as weird a combination of animal and habitat as anything out here. They do actually use a variety of wet habitats, from larger lakes to ponds to deep swamps to flowing watercourses, but I’m pretty sure upland forest isn’t on the list. 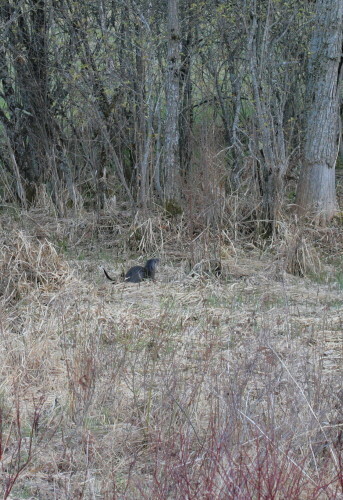 Just the fact that there was an otter in our little creek thrilled me no end, since they’re disappeared from the rural area outside of Toronto where I grew up. 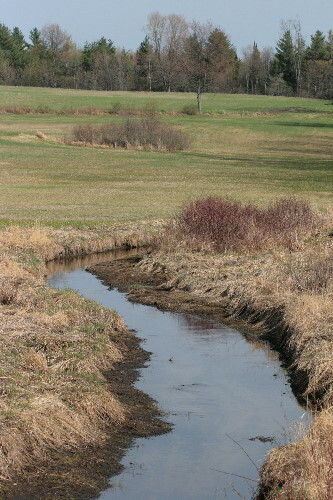 They’re nearly gone from Ontario south of the Canadian Shield as land development, for both residential and agricultural purposes, has changed the landscapes and, usually, the watersheds beyond what they can use. Aside from habitat, they need a healthy stream that supports a good population of fish and/or crayfish and other tasty morsels for food. The fish population seemed to be doing quite well in our creek, judging by the dozen or so individuals I saw through the glare on the water. I do hope that it’s a permanent resident here and I might happen to see it again on walks. I was disappointed as I watched it bound away; I had been hoping if I stayed still and quiet it might not realize I was there, and carry on down the creek below me, perhaps even diving for fish in the small pool below the bridge. I chastised myself for not having Raven on a leash, by which I could’ve simply pulled her to me. I was frustrated that she hadn’t come on the first, quieter command, when the otter was farther away and may have been less likely to hear. She did come, in the end, though, so I couldn’t be too upset with her. She can be such a dog, but her excuse is that she is a dog. And anyway, who could stay angry at a face like that. I laughed at the “you’re such a dog!” remark. So true! But that’s their joy and their shortcoming all in one word. And I don’t know anyone who’d want them any other way. Great find on the otter. I do wish the circumstances had been a wee bit different and perhaps you had gotten closer looks at it, but maybe next time. That it was there is gift enough. They’re only now making a comeback here in Texas, and the state is working hard to protect them. Still, they’re quite hard to find, but at least there’s promise that maybe that will change in time. I’ve yet to see a wild otter, despite spending hundreds of hours watching potential otter habitat. I think I must hold the world record for spotting water rats, water voles and water monitors. I hope your otter becomes a regular visitor. What an adventure, and such great shots of the otter. I have 3 that come and go around my property and I see swimming in the harbor during the wee hours of the morning. But I’m never prepared to catch any pictures! Just think, if Raven hadn’t flushed that otter you’d never have gotten all those great photos!